why do you need it as part of micropub? What queries should be and should not be part of Micropub? Essentials, or would just be nice? In Austin the topic of query for posts came up last year, and has been expanded. So, isn't your proposal for group properties a query for post statistics, over post lists? Is it city? Or state? aaronpk: That would be an interesting analysis. I need to go traveling now, for science! since it sounds like what you're trying to do is have a query that lets a micropub app provide buttons, it doesn't actually need a grouping funciton. what it needs is a way to ask your site for the buttons. aaronpk: We have query for categories...do we have autocomplete? i've dealt with a couple JS autocomplete libraries in the past, but it's been a while, and I haven't done any on mobile platforms. we'd just want to make sure we're doing it the best way for all the platforms. Autocomplete is when a text field provides options based on the existing text entered, sometimes providing default options when no text is entered, this is particularly relevant in the context of [[Micropub]] apps. Alright, I think that’s a good direction. We need some Autocomplete research and then some client experimentation. !tell aaronpk just noted mention of IndieAuth in #litepub re OAuth registration, and made me wonder: did we end up recommending a format for app name etc on the app URL? aaronpk: Zegnat left you a message 6 hours, 8 minutes ago: just noted mention of IndieAuth in #litepub re OAuth registration, and made me wonder: did we end up recommending a format for app name etc on the app URL? What happened with the discussion of using the web app manifest file? so, who volunteers to implement that somewhere? My personal IndieAuth endpoint consumes Web App Manifest files and it works great! was your endpoint published somewhere? github.com/EdwardHinkle/abode/blob/…rver-src/indieauth/authorization.ts is the file that parses things. Maybe I should like to that on my WAM documentation? aaronpk: where would that info "officially" live? extension to indieauth spec? or in the spec itself? hm, did you have thoughts about what to recommend to code hosting projects etc for user information? e.g. what username to show for IndieAuth users? aaronpk: the micro-banners at the bottom of your page - the 88x15 ones - are those only available as images, or is there an svg version of them somewhere? i think kevinmarks made svg versions but IIRC they were an svg with a bitmap inside. it does mean you don't need the CSS trick to force the browser to not smooth out the lines. sknebel: i suppose we could add something to the token introspection response that could return h-card info. for indieweb sites, the token endpoint would either already have that info, or could parse the user's home page h-card to get it. what is the font on the indieweb one? aaronpk: it might be worth proposing something like this to avoid people finding multiple other solutions? petermolnar: wouldn’t you want to use kottke.org/plus/type/silkscreen for authenticity sake? petermolnar.net/public/indieweb.svg - would this do it ? add those to the wiki page! I did try and put it inline with <html> but apparently that's not allowed. hm, If I do the microformats one would a real gradient be OK or would you want the subtle banding? peter, yours needs a white rect under it so it's not transparent. Its still early, but I found an iOS developer with an app that gets me tantalizingly close to being able to sync data out of my iOS HealthKit database up to my site. Currently, it supports automatic daily exports of a significant chunk of the data I want to a variety of targets, including iCloud Drive, Dropbox, and Google Sheets. I am in conversation with him about adding a webhook target. I want a daily POST to a webhook with JSON data containing my last 24 hours of health data, and then on-demand POSTs to a webhook every time I finish a workout. Found some SVG / CSS out there from someone attempting to re-create "activity rings". Its decent, but missing a lot of the pretty details. Yeah, someone with more CSS/SVG chops than me could likely make it look right. 1. When a ring goes over 100%, it should overlap and cast a drop shadow beneath. 2. The ring background color should be a gradient, not a solid color. 3. 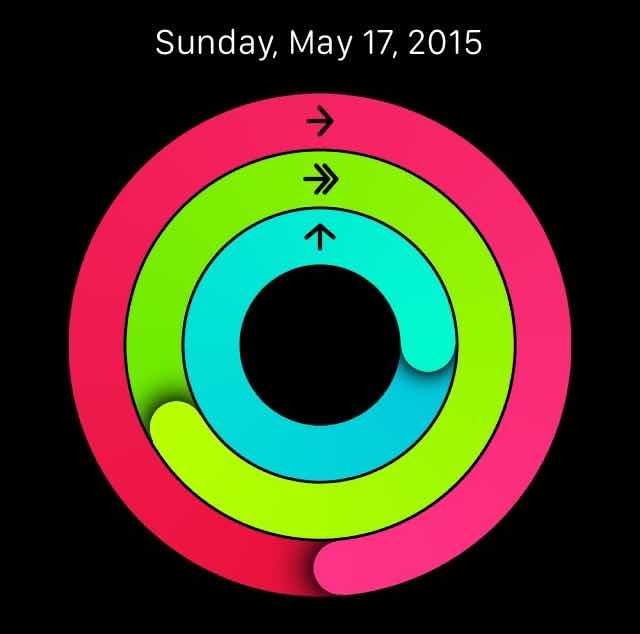 The symbols for move, exercise, and stand need to be overlaid on the rings. Do you have a repo for it? I might be able to take a crack at it this weekend. I think the main issue will be with the fact that the rings are just cropped circles. There is also code that I've found in Swift that can just generate it on-device and then that could be converted to an image and uploaded. hm. why does it work as an img tag on svgsshare and not on the wiki?